Sandblasted Engraved Diamond Paperweight 2.5" Diameter 60mm. Our sandblast etched crystal diamonds are high quality engraved with a proprietary sandblasting process that will leave you amazed at the precision and beauty of your final product. Sandblasting provides amazing resolution that is both deeper and clearer than laser etching. These beautiful engraved diamonds are frequently used with much acclaim for graduations, reunions, corporate events, prizes, awards and so much more. 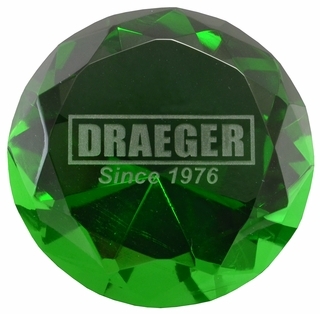 As low as $12.99 each* custom engraved diamond paperweight if ordering 12 or more of exactly the same engraving and color (Prices vary by color and quantity). Prices will be adjusted to lower price after order is placed. Please call or email if you have any questions. Personalize with your names, date, logos, image, or message. Scroll down for discounted quantity prices. This diamond is 2.25 inches wide (60mm) by 1.25 inches from face to point. Each custom engraved diamond paper weight comes packaged in a protective box which may not be suitable for a gift or presentation. Re-packaging might be required.Color, size, and cut of diamond may vary slightly. If you want a large quantity order for the crystal glass diamond paperweights please contact David at 1-800-982-5992 or Davidl@incrediblegifts.com for discount prices. Turn around time to receive custom engraved crystal glass gemstones is two to three weeks. A proof will be emailed for your approval, and must be confirmed before any engraving will be done. You may provide your own artwork in a jpg, gif, pdf, or bmp format. After you place your order you will receive a confirmation email. When you reply to your order confirmation email that is the time to attach your own artwork/message for engraving. Don�t be concerned about the size of your artwork, we will adjust it to fit, the larger the better.